After reading The Big Year, and seeing mention of Boise's Hollilynn Drive, the location where Greg Miller and Al Levantin went to see Gray Partridges, I just had to check this place out for myself. It also happens to be adjacent to the World Center for Birds of Prey which I had never before visited, but read a lot about. 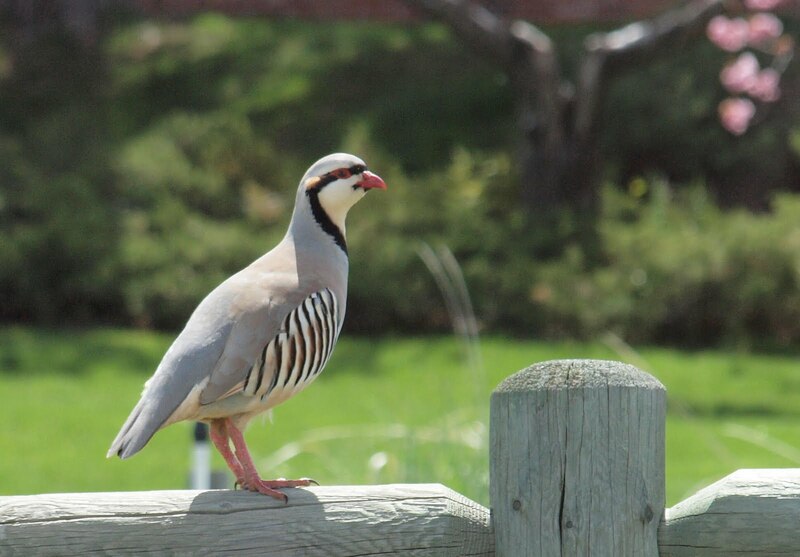 Anyway, I did not find any Gray Partridges, but I did find this Chukar posing nicely for me on Hollilynn Drive. 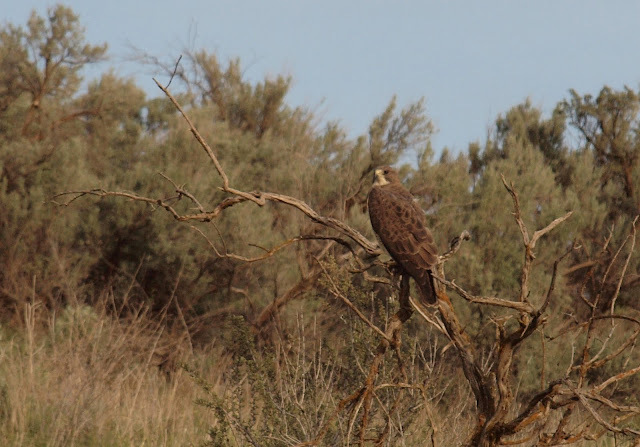 The World Center for Birds of Prey is also a worthwhile stop for visitors to Boise and there are plans underway to make it even better in the very near future! Last Sunday afternoon, I took my kids on a walk along Spring Valley Creek Trail to allow mom a much deserved nap. A couple of highlights: My 9 year old son Kyle carrying all three sisters across the creek so they wouldn't get wet. And the Wild Turkey that flushed right in front of Victoria. She was running up the trail ahead of us, rounded and corner and almost ran right into the Turkey. I saw it fly across the creek and run up the hill, but didn't get a photo. I thought it would have scared Victoria, but she was just so excited to have been the first one to find the Wild Turkey. Also, I was delighted that Anne, almost 8, was identifying California Quail and the Red-tailed Hawks by sound without any prompting from me...and my kids just barely tolerate my birding! 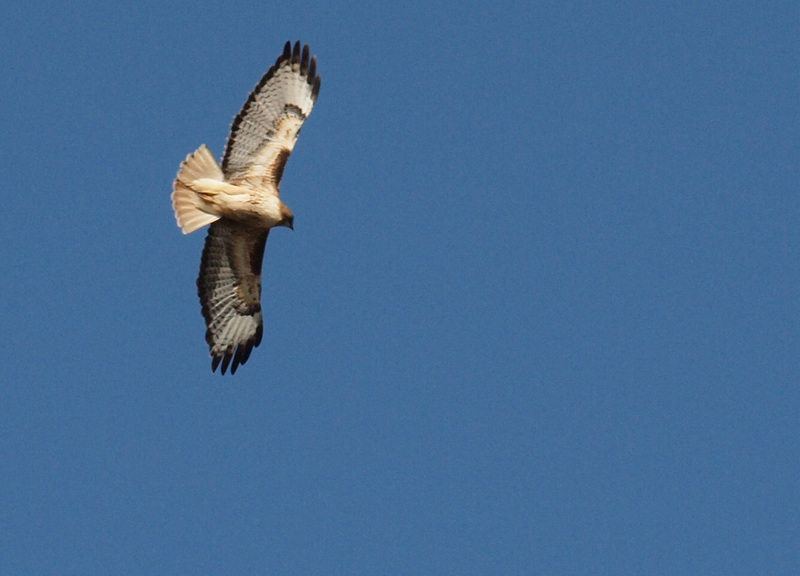 This Red-tailed Hawk wasn't too happy that we walked under her nest. This American Kestrel was posing nicely. I just wished its head were turned the other way to be in the light rather than the shadow. And I wish I could have been closer or had a higher powered lens. I believe this is the male Swainson's Hawk of Avimor's mating pair. Here he is perched on a snag near the dirt road. He allowed me to approach fairly close, but eventually did fly off. I captured the launch from his perch. I love his posture in the air with his legs stretched out and wings arched above its head with the open sky as the background. Too bad I missed having the focus on the bird to get the detail that would have made an okay photo into a spectacular photo, but hey, I'm still learning! And finally, on another recent walk with my two youngest girls, we found a Say's Phoebe with nesting material in her beak. "Girls! She's building a nest somewhere nearby. Let's watch where she goes and we'll know where her nest is. Within seconds she darted into the grated retention pond inlet. There we found her nest right on top of the white pipe. We'll keep watch for Say's Phoebe chicks in the coming weeks. Oh what a wonderful day and what a wonderful Dad your kids have! Believe me, your influence on them goes deeper than you think and they will thank you for it one day! When we lived in CO I used to drag my whole family kicking and screaming up to Rocky Mountian National Park. The kids were so reluclantat to leave their friends and Gus would rather have watched sports on TV but, once we got up there, everyone enjoyed themselves and now those are some of our best memories. As an added bonus all my kids now love the outdoors! 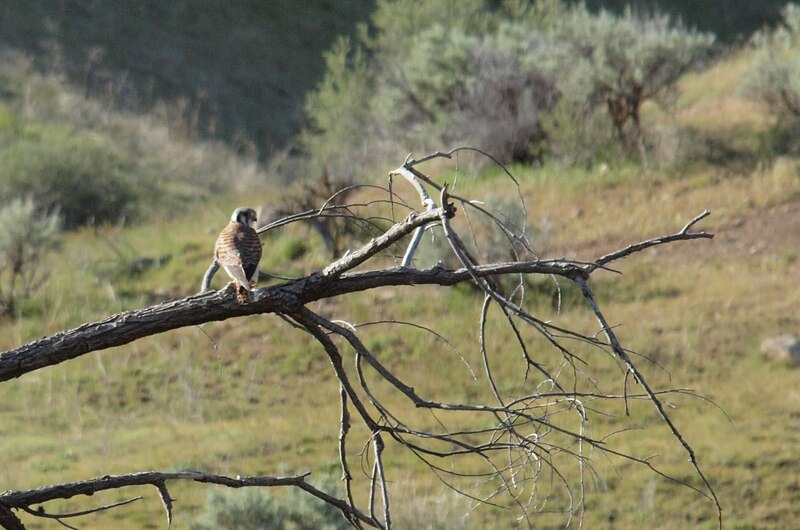 Great pics of the chukar and Swainson's hawks. You are doing just fine! And, you make me want to read that book again. It's been awhile and I so enjoyed it the first time! Nice photos! Just having the camera makes for more opportunities, and you're getting great shots ... they don't all have to be close-ups. I like the Kestrel in its habitat. Thanks for the kind words Kathie and Jonathan. Great shot of the Chukar, it would be a new bird for me. Sounds like you and your children had a wonderful day. Loved all the bird photos. International Migratory Bird Day - May 8th! Leslie Gulch, Oregon - Hiking and Birding! From Jail Birds to a Life Bird!